Bourges Basket are back in an EuroLeague Women final after an absence of five years with their victory over Wisla Can-Pack (66-59). Famila Schio needed overtime to overcome last season's runners-up Rivas Ecópolis (79-75) to qualify for their second Final Eight while this will be the first time since 2008 that a Spanish team is absent from the final phase of the competition. In the last night of EuroLeagie Women play-off matches the two home teams, Bourges Basket and Famila Schio, played in white uniforms. Wisla Can-Pack came to Bourges with a new head coach after José Hernandez' departure after game 2. They also had Alana Beard back in the starting line-up for the first time in the series. 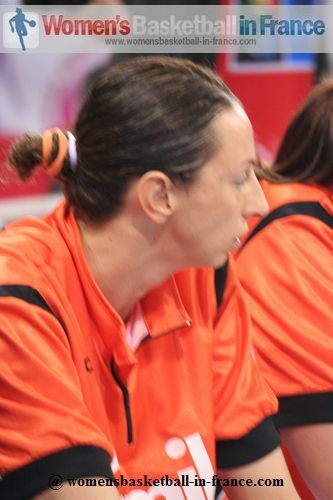 For Bourges Basket Jo Leedham was still not available to play. The match itself was intense. The officials had a hard time keeping everybody under control as the players and coaches tried their best to gain the psychological advantage. With Beard on fire at the start of the game Wisla Can-Pack dominated the first quarter (17-9). Bourges slowley crawled their way back into the game. With a 19-6 run across the second and third quarter they managed to wrestle the control from their guests (36-31). The two teams battled away and were still on level terms (55-55) with three minutes to play. The scoring battle between Nwal-Endéné Miyem (20 points, 14 rebounds) and Tina Charles (19 points, 16 rebounds) took centre stage. Yet it was Romane Bernies (above in picture) who stole the show with big plays down the stretch as her team made the final break to win the match. 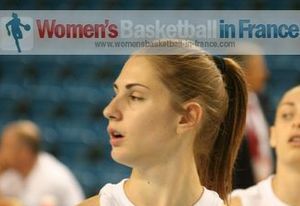 Bernies and Céline Dumerc finished with 12 points each while Styliani Kaltsidou added 11 points. Beard was the only other player in double digits for Wisla Can-Pack with 11 points. Laura Macchi (in picture), 33-year old international Italian veteran, showed again her offensive quality: she fired in 23 points to help Famila Schio beat Rivas Ecópolis (79-75). However it was her team-mate Giorgia Sottana with a three-ball with two minutes to play in overtime that finally broke the game open for the Italian champions (74-69). They then did the rest of their scoring on the free-throw line to win the game. The 2013 EuroLeague Women Final Eight group composition is based on the ranking of the teams during the regular season. Bourges Basket beaten at home in game 1"